Our first year at the Brown Street Park Halloween Parade. I grew up in New York City, which meant that on Halloween, I put on a costume and trick-or-treated in my apartment building, which as I recall was a quick run through a few neighbors in brightly lit and well-heated hallways. But in the third grade, I went to a friend’s new house on Long Island for Halloween. And that has always felt like my first real Halloween–crunching on autumn leaves in the dark, shivering in costume, and skipping from house to house to gather more candy than even I can eat. The first year that we moved to Providence, our neighbors mentioned that there was a Halloween event at Brown Street Park, so we decided to go. 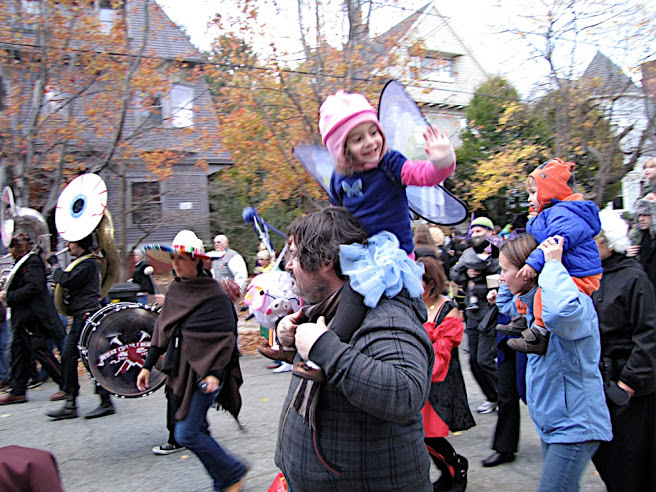 Of course, we had no idea that it included free games and treats for the kids and a costume parade throughout the East Side led by Providence’s own What Cheer? Brigade. Needless to say, it was a hit, and we’ve been back every year. This year will mark the 8th Annual Halloween Celebration and Parade at Brown Street Park, which will take place on Friday, October 31 from 4 pm-5:30 pm. For more information, visit www.friendsofbrownstreetpark.org.